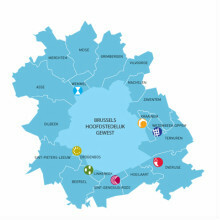 The ring of 19 Flemish municipalities around the Brussels-Capital Region is called the Flemish Rand. Discover the Flemish Rand-related site www.docu.vlaamserand.be featuring policy documents, statistics and scientific surveys. A kind of virtual library where visitors can download many recent publications. The site offers surveys and policy plans from the 19 peripheral municipalities and general works about the state reform in Belgium and language legislation, socio-economic and demographic trends, education and mobility. www.docu.vlaamserand.be also provides information in English, French and German. Initiated by the Flemish Authorities' coordination unit for the Flemish Rand, the site was designed by BRIO (Brussels Informatie-, Documentatie- en Onderzoekscentrum), in cooperation with the Flemish Government's study department, 'de Rand' and the Flemish Brabant province.